From the road, where the cars were packed together, and several hundred people had remained, not having had the courage to advance towards the muddy field, one could see the immense multitude turn towards the sun, which appeared at its zenith, coming out of the clouds. It resembles a dull silver disc, and it is possible to fix one’s eyes on it without the least damage to the eye. It does not burn the eyes. It does not blind them. One might say that an eclipse was taking place. 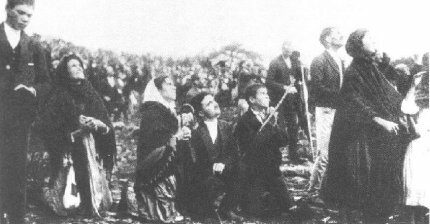 in The Whole Truth About Fatima. Vol.I. Prt.I. Documents on Fatima & Memoirs of Sister Lucia. — 2-nd english edition. — Fatima Family Apostolate, 2002. Mark Fellows. Sister Lucia: Apostle of Mary's Immaculate Heart. — Immaculate Heart Publications. — Buffalo, New York, 2007.